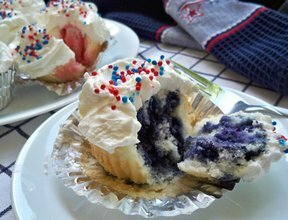 Colorful and delicious, these cupcakes are perfect for any 4th of July celebration or any special occasion. With fresh blueberry and strawberry-flavored cake and a whipped white chocolate frosting, they will be hard to resist. See fun and delicious ideas for adding red, white, and blue to your 4th of July menu. Have a stress free celebration with these helpful outdoor entertaining tips.